Colorado Security Company = Happy and Secure! Finding good, honest companies in the Denver Metro can be a difficult task. Whether you trust your neighbors, friends, or online reviews, you really never know what to expect. When it comes to home security, you definitely want the best, but over-paying is never necessary. Wisdom Real Estate has been trusting their clients to Colorado Security Company for the past four years because they prove time and time again that they work hard for the customer, offer competitive prices, and love what they do. Every client has been completely satisfied – thank you Colorado Security Company! Who is Colorado Security Company? 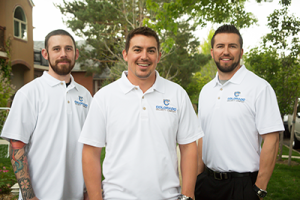 They are a home security company with over a decade of experience and hundreds of installations under their belt. They know you’re putting a lot of trust in a provider, so they go the extra mile to build strong customer relationships that last far beyond the installation. The techs are professional, courteous, and have a deep knowledge of security systems. They do what it takes to ensure that your experience leaves you feeling secure and confident. Installation is always free with a purchase of a new system. CLICK HERE to visit their web page, where you can contact them directly. You can also call 720-689-2234, or e-mail the owner, Brandon Donovan at Brandon@ColoradoSecurityCompany.com.